Bath Situation: A bathroom facility with toilets and a sink every 10 sites or so along the road. There is a central shower house near site 135 that can be quite a distance from some sites. There are 25 or so showers for men and the same for women that are 5-minute timed for a quarter. You can’t adjust the temperature and it can vary, but it’s pretty good. Dishwashing: There are no dishwashing facilities. There are water faucets along the camp road and you should wash your dishes on your site and take care with disposal of dirty water. Store: Can buy firewood at the gate, there is no real store at the camp. There is an ice truck that comes by every morning to sell ice and later in the day there is a wood truck that comes by. Midsummer on there is an ice cream truck that comes around. There is a store near the camp entrance that is relatively well stocked. Power/water: No electric, water in various areas. There is the ok for bigger RVs to use generators during certain hours. Be prepared that this becomes loud at times. Telephone/Wifi: There is no WIFI, but you can get some if you go over to the store near the camp entrance. Connectivity is spotty- both ATT and Verizon look like they have connectivity, but it doesn’t really work. There are decent cell signals near the shower house. 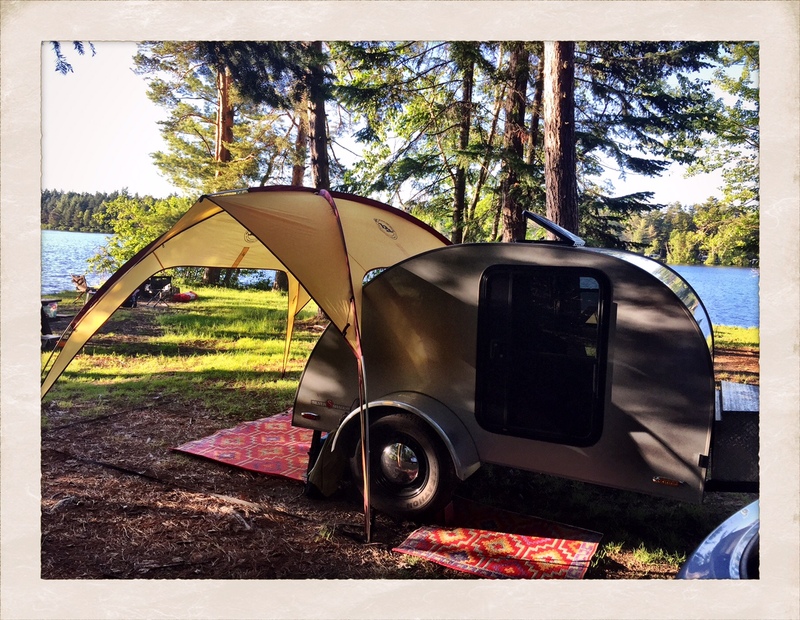 Amenities: The amazing thing about this campground is that nearly every site is on the lake shore and has access directly to the lake so that you can launch small boats from your site. The camp road is paved and a loop is possible to make for an almost 5 mile bike path around the camp. There is direct access to many hiking trails both around and away from the camp. 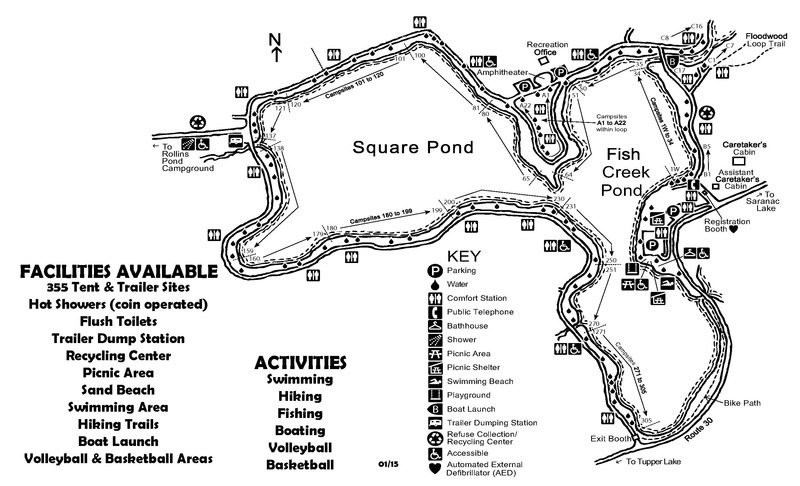 There is an adjacent campground called Rollins Pond that has a little more of a remote feel if you don’t like the looky-lou atmosphere that you can get into with Fish Creek. Sites: The sites are widely varied. There are some that are big and open, some that are deep, some that are shallow, some sunny and grassy and some that are heavily wooded. Some of the sites are really good for groups and others are close enough that you could have people across two sites. We loved this place so much, we went back again later in the year and found a wooded site that was perfect for us. Weird: This place is great, but there can be a lot of big rigs and it can be loud during the hours that they are able to run their generators. This place appears to have a lot of retirees who maybe settle in for longer stays. There are a lot of folks with signs at their camps and some who are selling things like walking sticks directly from their sites. As with anywhere in the ADK, there are a lot of Canadian campers. The rules say you should not “feed, attract or harass the wildlife.” That can be a bit hard to avoid when you have groups of geese and ducks constantly walking into your camp looking for food. At dusk the loons cry loudly and eerily and at 10pm, someone always plays Taps on a lone trumpet. Sometimes at dusk you’ll see a boat out in the lake doing some type of performance. Camper Types: The folks who camp here are a mix- some are groups, some really serious campers, there are many RVs of all sizes and lots of tents too. Many people bring their boats- kayaks, rowboats, fishing boats and wave runners. There are lots of retirees, but also lots of families with young kids or grandparents and grandchildren. one of the best camping in ny state.